In 1993, Judith and Michael Sleavin and their two children set out to live their dream: to sail around the world. But one night, a freighter off the coast of New Zealand altered its course by a mere ten degrees. And changed everything. After surviving forty-four hours in the water, with a back broken in several places and paralyzed below the waist, Judith miraculously survived. Doctors would later say she suffered one of the worst cases of post-traumatic stress disorder ever documented. News of the collision made headlines around the world, but, distraught, Judith never talked to the press. Her body was broken, and so was her soul. Twelve years later, Judith turned to her best friend, Hester Rumberg, and asked her to write what was too painful for her to write. The result is a gripping, unbelievable yet true story of one family’s love, of profound loss, and of a remarkable woman who decided to live when others might have decided otherwise. But always it is a stunning account of survival, a meditation on the strength of friendship and community. It is a universal tale of how any of our lives might be unexpectedly altered, how we might have to change what we hope for, and how we can move forward in times of tragedy. Judith Sleavin now divides her time between Portland, Oregon, and New Zealand. “TEN DEGREES OF RECKONING is a rare book. It both celebrates the love and spirit of adventure of the Sleavin family and tells in harrowing and gut-wrenching detail about the tragedy that claims the lives of three out of four of its members. To people who say: I can’t read such a sad story, I say only, you must. You must learn about and celebrate Annie and Ben and Mike so that they may be remembered. You must marvel at Judy’s bravery, her resilience, her will. You must repeat their story to others so that what befell them doesn’t happen again. 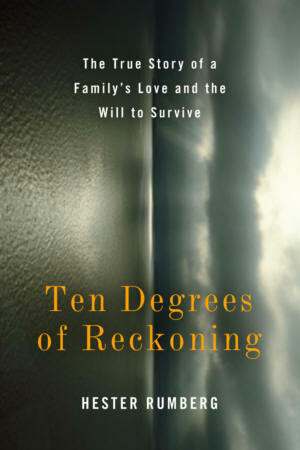 Read TEN DEGREES OF RECKONING. You must.